Harry thought the archway had a kind of beauty about it, old though it was. [...] But he did not move. He had just heard something. There were faint whispering, murmuring noises coming from the other side of the veil." Bunnies be damned: Christmas ain't got nuttin' on Easter. Despite the rewards, it can be a tough road to walk each year, and this Lent, I had an immediate, in-my face reminder of death. 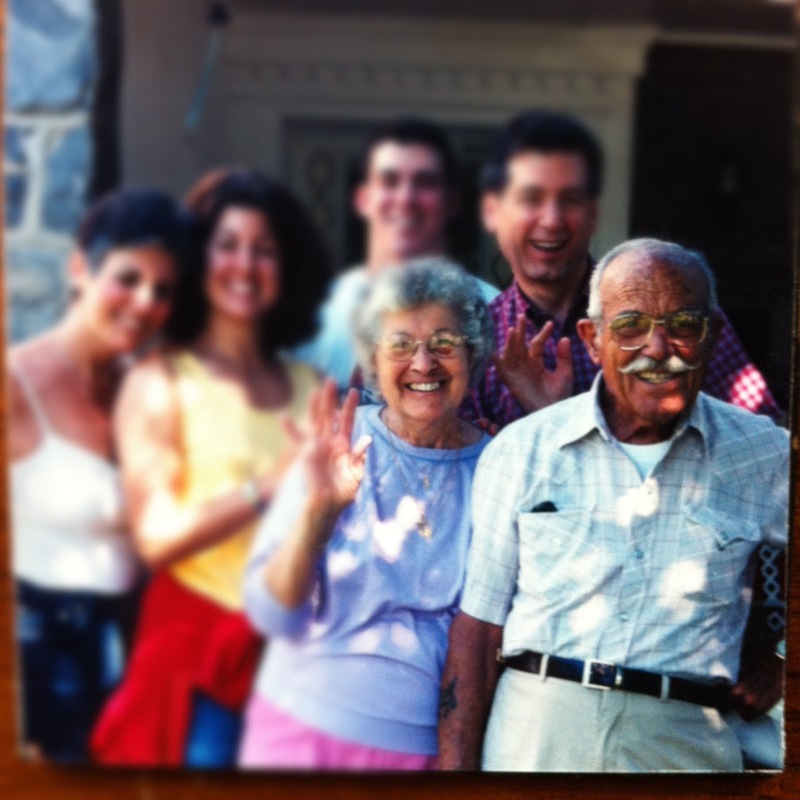 My grandfather -- a hearty paisano who at 90 years old was still doing all the house- and yard-work -- passed away after a month of illness, really the only month he was ever seriously sick in his life. He died peacefully during Holy Week, with my grandmom at his side, surrounded by family. We celebrated his life the day after Easter. I helped cantor the funeral mass. At the cemetery, an Honor Guard folded the flag and played Taps, and the whole clan watched the cemetery workers seal the burial plot. Afterward, Grandmom clasped her hands and exclaimed, "With a service like that, who can be sad?" Her sentiment was sincere and Easter-y, one I agreed with in principle but wasn't exactly feeling. My grandfather's swift decline had resurrected all my thoughts/doubts about the afterlife, the weight of eternity, the meaning of life, and the meaning of death. I saw the value in his long life and I also felt its quiet tragedies too. I was trying to experience and contemplate grief simultaneously (without success). I was a full-on emotional ninny. Then I remembered a conversation from the day before. While on one of our therapeutic walks, my mom and I had talked about the morning Grandpop died. "You know, when I was at the hospital with the body, I turned to my sister and said, I'm jealous," Mom told me. "What does he know now that we don't know?" She paused. "What does it say about the human condition that we work so hard to figure out what comes next? That we actually try to study this? We're never going to figure it out. The only way to know is to die. Period." But 'to die' means many things, doesn't it? It can mean keeling over. Expiring. Giving in. Sacrificing. Letting go. Accepting. Dying in all its forms, physical and spiritual, shortens the distance between our human existence and the great unknown. It draws us closer to the veil. We won't get to see through it until the last step. But we might feel it flutter, and we might hear the voices. Now that I'm back in my house and my routine, away from the comforting distraction of viewings, funerals, and deli platters, I hear Grandpop's voice. I'm eight years old. The days are getting longer. The school year is waning. Grandmom is cooking dinner up at the house, but I'm with Grandpop in his tomato beds at the foot of the steep hill in their backyard. The air is pungent and green. Grandpop moves gingerly through the rows, checking his bumper crop. His workman hands -- the ones that fix motors and light Marlboro Reds -- are gentle with the new fruit. In such a quiet moment, heaven was wedded to earth and I didn't know it. I didn't mark it with words or ceremony. I didn't take a picture. I didn't need to, though. I was living the blessing with someone I loved. And maybe that, in the end, is what life is about. I watch you walk across the sloping lawn toward the vine-covered archway. You seemed a little nervous when we said goodbye, but now I see your steps grow more confident. Your bum knee isn't giving you as much trouble. Your back is straighter. Your arms swing wider. It's selfish of me to want you here, isn't it? As if I didn't have enough of you, as if I won't remember you. But I suppose there are others waiting who have missed you too. They'll be happy to see you, and they'll be happy it took you so long to show up. Are they holding your hand already, and I just can't tell? Do you hear glasses clinking and people laughing, smell gravy cooking? Are you remembering things you'd forgotten you forgot? Are you learning things you always knew you never knew? Are you feeling things you've felt before, but nothing compared to what they feel like now? Is that why you're walking a little bit faster? Just before the arch, you turn and wave to me. Your smile catches the late-afternoon sun. I blink, and then you're through it, out of sight, leaving only slight indentations in the grass and a long shadow that hasn't reached me yet. But one day it will, and then I'll know you again. For any of us who have had to let go of a dear relative through death, your words are magical, expressing what we feel but cannot articulate. Thank you for sharing such warm personal thoughts, and underscoring our belief that we will see our dear ones again. Please note that I am a great friend and admirer of your father. I see you are continuing his communication mastery.